Three goals in the space of six minutes at the start of the second half helped high-flying Wigan Athletic to a convincing win at Swindon Town. Will Grigg swept Chris McCann's cross past Tyrell Belford to put Wigan ahead. And the Latics romped clear after the break, with Max Power's fine 25-yard curler, Grigg's deflected strike and Sam Morsy's low drive making it 4-0. Nicky Ajose slotted a consolation for Swindon, who had Nathan Thompson sent off for a reckless challenge late on. Wigan remain second in League One, three points behind leaders Burton but having played a game more than their promotion rivals, while Swindon are 14th. "It's never perfect - it was very close. I thought first half we played very well and we contained them. "These are a difficult side to prepare to play against. If you don't work hard against them, then they'll punish you. "Second half we were devastating for 15 minutes." Match ends, Swindon Town 1, Wigan Athletic 4. Second Half ends, Swindon Town 1, Wigan Athletic 4. Foul by Haris Vuckic (Wigan Athletic). Attempt missed. Chris McCann (Wigan Athletic) left footed shot from outside the box is just a bit too high. Nathan Thompson (Swindon Town) is shown the red card. Attempt missed. Fabien Robert (Swindon Town) right footed shot from outside the box is close, but misses to the right. Goal! Swindon Town 1, Wigan Athletic 4. 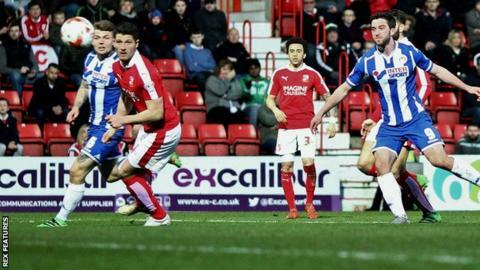 Nicky Ajose (Swindon Town) right footed shot from the centre of the box to the centre of the goal. Assisted by Michael Doughty. Substitution, Wigan Athletic. Haris Vuckic replaces William Grigg. Craig Davies (Wigan Athletic) is shown the yellow card for a bad foul. Bradley Barry (Swindon Town) wins a free kick on the right wing. Fabien Robert (Swindon Town) wins a free kick in the attacking half. Substitution, Swindon Town. Fabien Robert replaces Jermaine Hylton. Substitution, Wigan Athletic. Craig Davies replaces Yanic Wildschut. Attempt blocked. William Grigg (Wigan Athletic) right footed shot from outside the box is blocked. Corner, Swindon Town. Conceded by Jussi Jääskeläinen. Attempt saved. Nicky Ajose (Swindon Town) right footed shot from outside the box is saved in the centre of the goal. Attempt missed. Yanic Wildschut (Wigan Athletic) left footed shot from outside the box is close, but misses to the right. Substitution, Wigan Athletic. Tim Chow replaces Max Power.